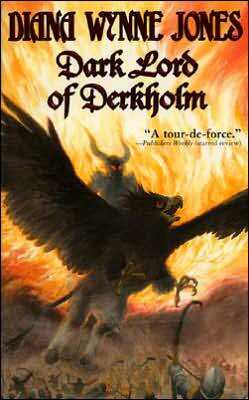 Despite being made fun of for a few days for reading a book with such a high fantasy cover on it, I had a wonderful time with my reread of Dark Lord of Derkholm. This was one that I enjoyed but didn't love the first time through. It had a complex and quick-moving plot and a lot of characters and creatures in it. I think I was overwhelmed a lot of the time. And yet, as I thought about it over the past 3 1/2 years, I started appreciating it more and more and finally got excited for the time when I would be able to reread it. Well, now I have and I can honestly say that I was completely satisfied this time through. Yes, this is pretty much a high fantasy novel but the main point of it is the family relationship between Derk, his wife Mara, and their children -- both human and griffin. Derk's special talent is the ability to make things grow, things being both plant and animal. He has many experimental animals in the yard--horses with wings, invisible cats (that might not be in the yard anymore), flying pigs and more--but only one of his creations was given human DNA and those are the griffins. When the world is threatened by a ruthless man from a parallel universe and his "Pilgrim Parties" into the realm, the entire family will have to come together to make things right. And they're not perfect--sometimes far from it--but even in the darkest times they can count on each other. And this is what I loved. This book absolutely qualified for the Once Upon a Time Challenge and hopefully it will just be the start of a wonderful set of reads! I absolutely LOVE Dark Lord of Derkholm! One of my favorite DWJ novels. I remember reading this in high school and laughing hysterically at the satirical high fantasy elements. The sequel Year of the Griffin is wonderful too. I thought this book was a lot of fun, but I didn't LOVE it the way others have. I think I read it after reading the Howl & Sophie series and just didn't love the characters as much. Though I LOVE the premise of the book! Rereads are so comforting. I really wish I made more time for them. Sounds like something my daughter would love! Jenny - I am so glad I reread this one. I was in a better place to appreciate it this time through. I liked Year of the Griffin a lot more the first time I read it so I'm excited to reread that one now too! Aarti - I think that's a common problem with some of DWJ's books. You read them in an order that makes some of them seem a bit dull after other brilliant ones. However, I've found that, upon reread, my opinions of almost all of the dull ones have improved! Col - I've really upped my rereads this year and it's been fantastic. I think going forward I am going to need to make them more of a regular part of my reading schedule. And I hope you suggest this one to your daughter! Hmm, maybe I should try a reread on this one too. I LOVE Diana Wynne Jones, but this particular one didn't grab me. I think it was too long and complicated and high fantasy-esque. But maybe I'll like it better a second time through! I do remember liking aspects of it, and the premise is great fun. This does sound like fun - and that cover - Wow. It's probably out of my league to be honest though. I do like fantasy but this sounds like a proper fantasy lovers realm! Marvelous - I think this one worked a lot better for me the second time through because I focused more on the characters and less on the fantasy elements. I became more invested in the characters in Year of the Griffin so I think I just "knew" them better this time around. Lynn - This is actually a bit of a spoof on fantasy so you might actually like it. It puts in common fantasy elements because they're "supposed to be like that". It's pretty fun. I love re-reading; you never know what's going to happen!